Some of the most creative and fun costumes are made within hours or minutes of trick-or-treating. Use what you have on hand, swap clothes with your brothers and/or sisters and/or parents. Just make sure you have permission, of course. He used one of my husband’s old suits, (from hubby’s bank management days) along with a tie. We already had the white Oxford shirt but a polo shirt with a collar could work as well), and you don’t have to worry about shoes. Sneakers (any color) work beautifully with this look. You do have to have sunglasses for this costume, they really cap it off. Everything, totally free! Not one cent spent. Sadly, I believe this was the last year my son trick-or-treated because some idiot at the far, far end of our neighborhood got really angry with him, yelled that our son was too old for trick-or-treating, and refused to give him candy. My son’s feelings got hurt and when I found out, I was appalled. Had I been out with him that night instead of my husband, I would have given that man a piece of my mind. No one messes with my son!! I believe it was the first night I’ve ever thought about egging someone’s house. I never was allowed out on Mischief Night (the night before Halloween up north) as a child. This Halloween night, I was very close to following through but…I didn’t. I have to say, though, the thought of it gave me some joy. I say you can trick-or-treat right through high school as long as you’re creative about it. I don’t like it when it’s obvious that the teenagers didn’t put any thought into their costumes or aren’t even wearing costumes!! That’s just wrong because it honestly doesn’t take a lot of effort to be creative. 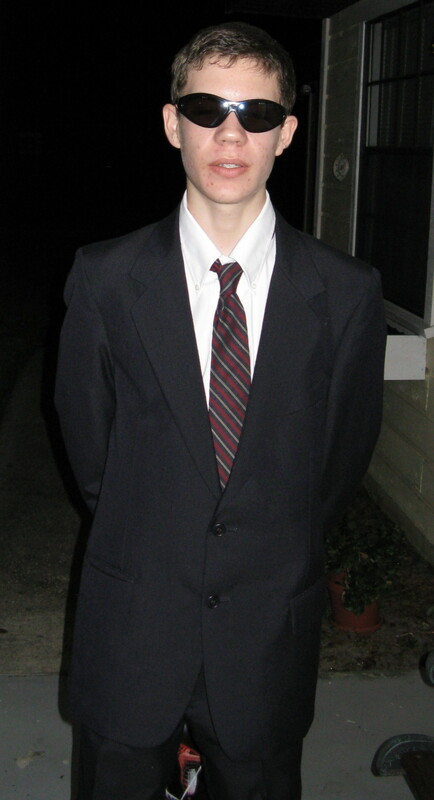 In my son’s senior year in high school, they had a dress-up day for Halloween with a theme: come as a character in a book. He chose Dorian Gray and yup, we used the same black suit. This exact same suit can also be used if you want to dress as a “rich or wealthy man” for Halloween. Just add a pocket watch and a cane for trick-or-treating. What costumes have you made from a suit? It’s Halloween! Got a sheet? Another year has flown by and you realize it’s October 31st. Your child can’t wait to go trick-or-treating, or is eager to dress for a school or friend’s Halloween party. You then realize you didn’t buy a costume or haven’t had time to buy a pattern, the fabric and sew it up. Quick! What do you do? Grab a sheet. The Mummy – You probably have a couple of well-loved sheets that have seen better times and have a few worn spots or small holes in them. Yes? Well, grab one of those. Make a little snip on the edge (make 2-to 4-inch wide strips), and rip it apart. Continue until you have enough. You can easily tie the pieces together and wrap your child up. A Ghost – The age-old good-to-go costume at the last minute. For smaller children, you might want to tear the sheet in half or even quarters. Make sure your child doesn’t trip on the sheet, so cut or tear it to ankle length. Also, a good safety measure is to wrap a strip as a belt around their waist (or use a belt), and make sure their little arms can move freely. Types of hats you can use? Ski cap (in colder climates), cowboy hat, fireman’s helmet, bicycle helmet (great because they usually have reflective tape on them already), crown or tiara. Use common sense with this aspect of the costume and the age of your child, please. If your child is older, you can cut large eye holes and they should be alright. A quick tip to keep the sheet from traveling over your face while walking, you can use a safety pin in the back to keep it snug around the face (older children only). Again, I would also recommend a hat to help with this as well. Use your imagination!! Injured person – For the teen crowd, tear a sheet up and use the strips as bandages. Put one around your head to cover a pretend wound (get out that red magic marker!) Wrap another one around your arm and/or leg. Turn another large swath of the sheet into a sling. Grab a branch and you can use it as a cane. Or you can borrow someone’s old crutches or your grandfather’s cane. To top off this sort of costume, make up your own story to go along with the costume. Are you a hero on a quest thrown from your horse? Have you battled a dragon? Were you a firefighter that saved someone? Come on, teens, you play all sorts of online games fighting all sorts of creatures, use that imagination!! Wear clothes appropriate to your story (and a lot of them can be simple jeans and shirt), and you’re all set. Above all, have fun with it! 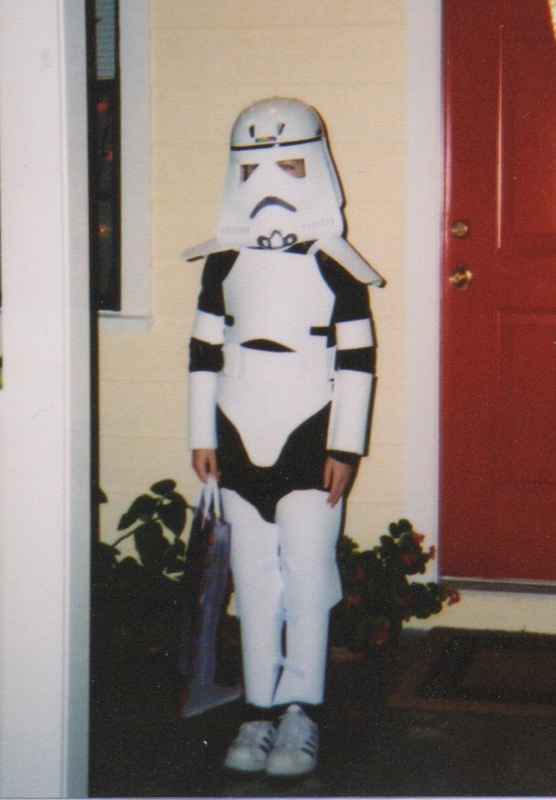 Here is the Star Wars StormTrooper costume that was a real winner for Halloween trick-or-treating for several years. Whether you spell it Storm Trooper or Stormtrooper or StormTrooper (I’ve seen them all in my Internet search so I’m putting them all out there), it’s actually a pretty easy costume to make. My son came home from his weekly trip to the library with a huge book on Star Wars entitled: Star Wars : The Visual Dictionary written by David West Reynolds; special fabrications by Don Bies & Nelson Hall; new photography by Alexander Ivanov. This is a fantastic book for you to get an up-close look at all the costumes, gadgets, ships, creatures and more that were created in Star Wars! There actually are several of these books to cover later episodes of Star Wars as well, but the above book is the one he brought home that day. We found a great photograph of a StormTrooper and I went to work brainstorming on what sorts of materials I could use. As someone who used to be the Operations Manager at a fabric and craft store, I mentally went through the store I used to work at to see all of my options. Shopping list in hand, I bought numerous white foam sheets of various widths and some double-sided tape. The rest I had on hand at home. I used one of the thinnest sheets of foam to form the visor or front part of the helmet. I cut out the pieces for his eyes, and using a second sheet of foam, cut out a wide “W” to glue under both eyes for added depth. (Sorry, you can’t really see that in this photo but you’ll understand when you get the book.) I then cut out a “frown”, colored it with a black marker and glued it on with craft glue. Don’t worry about over-spill; the glue dries clear! I then drew on the hashes and the air-thinga-ma-bobber on the chin of this visor with black marker. See it? Remember: The trick to the eyes is to make sure they’re the right shape but also large enough for your child to see through completely. Now, if you notice the photo in the book, you’ll see the bottom of the front of the StormTrooper helmet is rounded. That’s where the toilet paper rolls come into play. For this, I simply rolled the sheet around the two rolls using craft glue. I had my son hold onto them while they dried. Once dried, I used a strip of double-sided tape to attach this visor to the front of his bicycle helmet. I wish you could see the back of this costume too, but I didn’t think to take a picture of it years ago. Using a thicker foam sheet (probably about 1/4-inch), I created the StormTrooper’s backpack, cutting out pieces from a thinner foam sheet and gluing them onto the thicker base to add depth and create the pack-look in the book. It came out beautifully. Again, I used craft glue here. I believe I glued the shoulder ‘wings’ onto a long piece of 1/2 or 3/4-inch wide white piece of ribbon then glued them onto the chest piece (front and back). My son could then slip this piece on over his head quite easily. As you can see, I used black hook-and-loop fastener to attach the front & back chest pieces together, and did the same for the lower torso but with white hook-and-loop fasteners. I believe I used a couple of dots of hook-and-look fastener for the belt. What did I use to attach the hook-and-loop fasteners to the foam sheets? 🙂 Hot glue from the glue gun. Read on to discover why. I originally hole-punched and tied the above-referenced pieces AND the arm and leg pieces in the back using white ribbon (10 ft. for $1) because when I was talking to a friend and expressed my choice of using a glue gun, she exclaimed, “No! You can’t do that! It’ll melt the foam sheet!”. However, after the first Halloween, we discovered that the leg pieces (especially the thigh pieces) kept sliding down. I just couldn’t tie them tight enough and the ribbons kept loosening and untying themselves. So, with that in mind the next year, I used the glue gun!!! And??? It worked like a charm! No, it didn’t melt the foam sheets. I glue-gunned the pieces of hook-and-loop fasteners to upper and lower torso pieces as well as the leg and arm pieces. Easy on-and-off. The thigh pieces stayed in place for the most part although, in the above photo, they had slid down so it looks like his leg pieces are all…well, one piece. They aren’t. If he had pulled up his thigh pieces, you would be able to see the separate calf pieces with black knees showing in-between them. If I made this StormTrooper costume again, I would somehow attach the thigh pieces to the lower torso pieces, just so you don’t have to keep pulling them up. But…other than that, it was surprisingly simple to make and lasted a long time. Just make sure to take it one step at a time and be creative! Oh, and because the helmet is almost completely enclosed, it does get a little warm in there. Make sure you have your child take off the helmet throughout the night to get some fresh, cool air. Here in Florida, the weather in October can be pretty warm sometimes. I hope you have fun with this Star Wars StormTrooper costume or any other costume you feel inspired to create from that Star Wars book or any other book! **Looking at the picture once more** Wow, we really did luck out with his white sneakers and his white bicycle helmet, didn’t we? One of the most annoying things when getting dressed in the morning or for an evening out is to discover you’re missing a button. Most of the time, you only need one button to replace the broken or missing one, and you can’t buy a single button from the store. You end up buying a “pack” of two-to-four buttons, buying more than you actually need. That’s not very cost-efficient and let’s face it, the buttons themselves can be expensive. Plus, who has time to run to the store or wait for a sale when you need that extra button right away? A small glass jar lets you easily see what you have available. 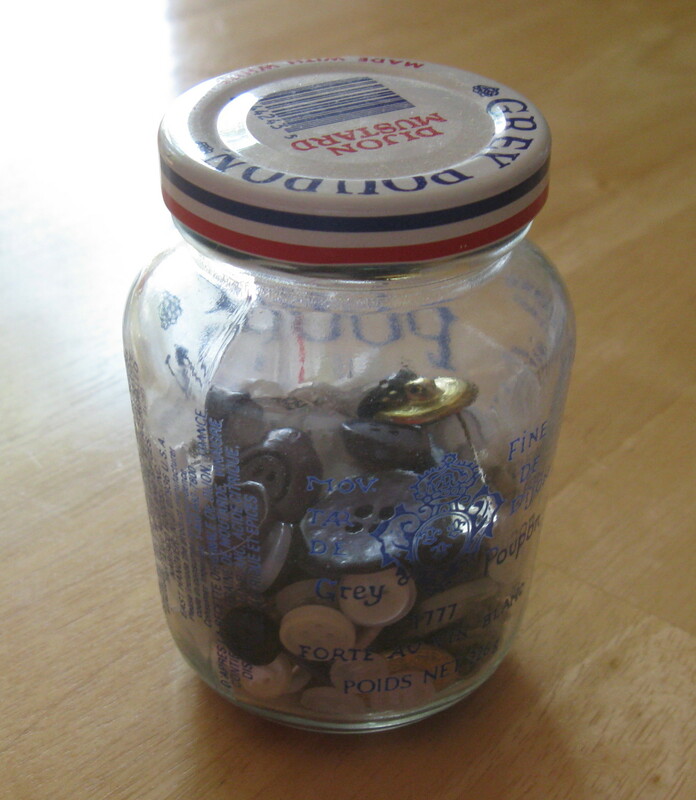 One tip I learned long ago, was to remove all buttons from your worn-out, stained, ill-fitting clothes before you throw them away and place the buttons in a glass jar like this one. Don’t forget to add those extra buttons that come attached to your clothing (skirts, shorts, slacks, shirts) too. Bonus tip: If you really want to be efficient, put a small spool of thread (black, white, and/or color of most of your clothes) with a needle in the jar as well.